I am addicted to smoked turkey legs. I go to Oktoberfest for two things: beer and turkey legs… ok, and every type of wurst known to man. Honestly, though, those turkey legs are getting so expensive! They run $10 and up now. Blerdy Momma is not rich, you guys. But, Blerdy Momma can cook. It turns out all you need for your own smoked turkey legs is a good brine and some flavorful wood chips. 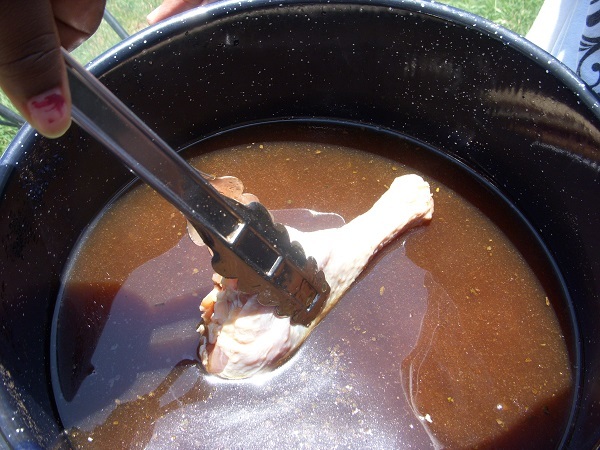 A basic brine starts with salt and sugar dissolved in water. The rest of the spices are totally up to you. This is fabulous on turkey legs!! Stir together the ingredients in a large pot and bring to a boil for 5 minutes. Let cool to room temperature and refrigerate until needed.